The woodchat shrike (Lanius senator) belongs to the family of shrikes, the Laniidae. 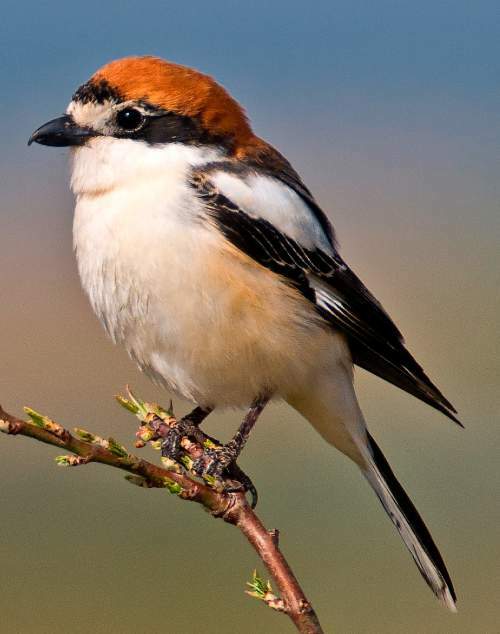 The woodchat shrike species is distributed in southern Europe, Mediterranean region, west Asia, northwest Africa and sub-Saharan Africa. A vagrant shrike was recorded in Alibag, Maharashtra in India. These shrikes are polytypic species. The woodchat shrike (Lanius senator) is a medium-sized typical shrike, measuring 18 to 20 cm in length and weighing 20 to 60 grams. These species are sexually dimorphic. The male nominate woodchat shrike has grayish brown upperparts and chestnut crown and nape. The forehead is whitish and these is a black mask across forecrown and eyes. There are broad white patches on dark wings. The rump is white and the tail is dark. The female woodchat shrikes and juveniles have brown vermiculated upperparts and buff vermiculated underparts. The bill is pale brown. The tail is brown and plain. The bill is short, straight and steel gray in color. The tip of the upper mandible is curved. The irises are blackish. The legs are gray. The call of these shrike species is a soft, repeated "kwikwik" or "pitquur" sound. These woodchat shrikes are distributed in southern Europe, Mediterranean region, west Asia, northwest Africa and sub-Saharan Africa. A rare vagrant shrike was photographed at Alibaug, Maharashtra (India) and reported by Parag S. Nandgaonkar (2013), in Indian BIRDS 8 (6): 164. The woodchat shrike nominate subspecies L. s. senator is distributed in central and southern Europe. It winters in central and western sub-Saharan Africa. The subspecies L. s. badius is distributed in islands in west Mediterranean. It winters in western Africa. The woodchat shrike subspecies L. s. niloticus is distributed in Cyprus, south and east Turkey, Georgia, Armenia, and Azerbaijan, north Iraq, Kuwait and Iran. It winters in eastern Africa. 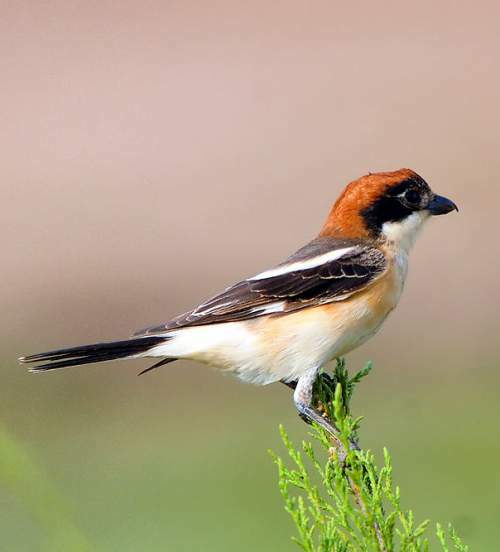 The woodchat shrike subspecies L. s. rutilans is distributed in Portugal, Spain, Gibraltar, Morocco, northern Algeria, northern Libya and Tunisia. The wintering populations are found in western sub-Saharan Africa. The Important Bird and Biodiversity Areas (IBA) of these woodchat shrike species in Italy are, Coast between Marina di Camerota and Policastro Bussentino, Ausoni and Aurunci mountains, Alburni mountains and Murge. The IBA of these woodchat shrike species in Greece are, Valtou mountains, Mount Taygetos, Mavrovouni mountain, Larissa, East Lakonia mountains and Acheloos valley. The IBA of these woodchat shrike species in France are, Vallée du Régino, Hautes garrigues du Montpellierais, Estuaire de la Gironde : marais du Nord Médoc and Garonne : marais de Bordeaux. These woodchat shrike species have low forest dependence. They normally occur in altitudes from 0 to 2400 meters. The artificial ecosystems and habitats of these shrike species include heavily degraded tropical and subtropical forests, agricultural lands, old orchards and rural gardens. The natural ecosystems and habitats of these shrike species include open woodlands, tropical and subtropical dry grasslands, tropical and subtropical moist lowland forests, semi-open areas with bushes and well-spaced trees, high altitude grasslands and dry shrublands. The diet of these woodchat shrike species consists mainly of large insects. Insects like grasshoppers, dragonflies, ground beetles, scarab beetles, wasps, bees and also vertebrates like small voles, mice, lizards, frogs and birds are their primary food. These shrikes occasionally feed on plant material like fruits and berries. They hunt their prey from prominent perches and impale the catch on thorns, before consuming. For this feeding habit, they are also known as "butcher birds". The breeding season of these woodchat shrikes is during May and June in southern Europe. The laying season is during April and May in northern Africa. The breeding season in Israel is in March. The southern shrike breeders usually raise two broods. These woodchat shrike species are monogamous and highly territorial. The nesting site of the shrike is usually a lateral branch of a tree, often of oak, pine or fruit tree. They are also known to nest in low dense bush. The woodchat shrike nest is a compact cup-like structure built with twigs and rootlets and lined with moss, lichen, wool and spiderweb. The typical clutch contains four to eight off-white eggs with brown and gray mottling. The female woodchat shrike incubates the eggs and the chicks hatch out after 14-16 days. Both the parents feed the hatchlings. The young fledge 18-20 days later, but are dependent on parents for further three to four weeks for food. These woodchat shrike species are fully migratory birds. The breeding populations occur in southern Europe, Mediterranean region and west Asia. These populations migrate to sub-Saharan Africa, north of the equator, for wintering. The global population size of the woodchat shrike (Lanius senator) is estimated at 5,950,000 to 9,590,000 mature individual birds. The overall population trend of the species is considered to be decreasing. In most of its range, this shrike species is reported to be locally common. The generation length is 4.0 years. Its distribution size is about 12,000,000 sq.km. Habitat alteration and destruction, deforestation, change in agricultural practices, hunting for food and sport hunting are the main threats that are endangering the survival of these shrike species. The woodchat shrike (Lanius senator) does not approach the thresholds for being Vulnerable, either under the range size criterion, or under the population trend criterion or under the population size criterion. The IUCN (International Union for Conservation of Nature) has categorized and evaluated the shrike species and has listed it as of "Least Concern". The CITES (Convention on International Trade in Endangered Species of Wild Fauna and Flora) status is ‘Not Evaluated’ for the woodchat shrike (Lanius senator). The four recognized subspecies of the woodchat shrike (Lanius senator) are: Lanius senator senator Linnaeus, 1758, Lanius senator rutilans Temminck, 1839, Lanius senator niloticus (Bonaparte, 1853) and Lanius senator badius Hartlaub, 1854. 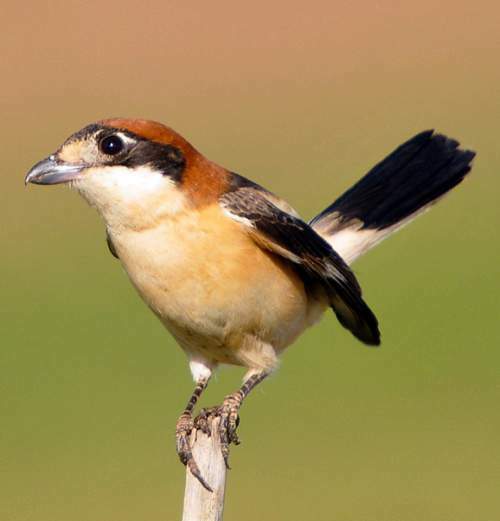 Current topic in Birds of India: Woodchat shrike - Lanius senator.